Here we are, almost spring. According to my 2013 Read-Along plan, it’s time for Proust: In Search of Lost Time, Vol. 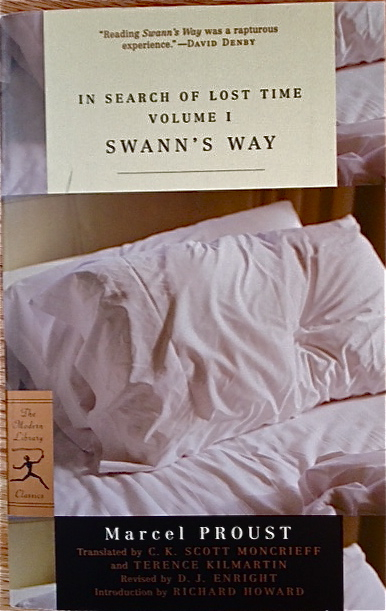 1, Swann’s Way. “So, Proust. Have you made it past the first 50 pages? Right. But I do urge you to finish this very helpful Guardian article on Proust. Those who are familiar with Read-Along’s on Ripple Effects know, we go slow. Ah… go slow on Proust? Well yes, that just means you can read Chandler and Hemingway while you’re watching young Marcel struggle to sleep. Here’s our very simple plan. You can read whatever version you like, if you’re so inclined, the original French edition will even be better. We can compare notes and thoughts. I’ll stick with the Modern Library version in the photo above, just because of the enticing cover. Two months to finish In Search of Lost Time Vol 1: Swann’s Way. I’m sure with our mutual support, we can all go past page 51 and even reach the end. Interested? Do let me know in a comment. I’ll be sure to add and link your blog in the following list. If you’re not a blogger, you’re welcome to join in as well. Just come by on the two posting dates and share your thoughts. Hope to see you join in. You are in for a treat! Looking forward to seeing what you make of it! Arti, I am joining you. I hope Proust and the spring Once Upon A Time reading event will get me back into blogging. I confess, I have never read Proust, and I think I’ll give it a pass for the time being. My life is moving too fast to slow it down with Marcel’s sleep issues. But I’ll be curious to follow the conversation along! You’re spared… this time. 😉 Most welcome to stop by the pond then. Looking forward to it, already listening to it from Naxos Audio in the car. It’s slow, to be sure, but so lovely…well, I’ll save that discussion for later. Tuesday from tuesday in silhouette said she wished to join in as well. Thanks for joining me … have enjoyed the camaraderie of reading with you Anna K. Thanks for bringing a friend too. I’ll be sure to link you both. Looking forward to this. You asked in one of your comments in my blog what type of camera I used. Lately I have been using two, my Nikon D40 and my little Panasonic Lumix. I used photos from both in my posts. I’ll read Proust sometime in the future, may be when I have all 8 volumes in French, but since I have only 3, I think I’ll wait for a while. Right now I am reading “We’ll always have Paris” by John Baxter, an Australian. I like it – it is funny. Have you read it? Hey Arti! I was inspired to start Proust after seeing the Guardian readalong as well! I’m also reading the Moncrieff translation. And yes, since I’m a slow reader, I’ve started too so I can finish that first part to write a post by April 15. You know we’re just getting a little first taste of Proust, just Vol. 1 I think that will do for the time being. 😉 Thanks for joining us! Great! I’ll link your blog here on the list. Look forward to our discussions. Oh you’re very brave. I read 20 pages or so at some stage in the past. Would love to try it again, but I know that this year isn’t the year. I have a couple of books about reading Proust, I’m sure I’ll get to those first…. All the best with your project, and you’re welcome to stop by the pond and see what we have when the postings come. Thanks for your interest, even though you may not have time to take part in this read-along. I finally ordered this book today. I have wanted to read it forever, but I might have not made it more than 50 pages in myself at one time in college when I picked it up. So glad you can join us! You know, I don’t think any of us would go past many pages on our own. However, I must say having read about 150 pages so far, I find it less intimidating than I first thought, and, despite a lot of times Proust has lost my attention with his long sentences, I quite enjoy his recollections of his childhood town Combray, and all the folks there. His writing style of course is beautiful, albeit through translation. And remember, we’re only doing the first part (264 pages for my edition) to post April 15. So, we still have a few more days to go, lots of time. Looking forward to reading your thoughts. I’ll add your link to the group list. Arti, due to life and all it holds I am behind on my reading. Will post on Combray when I actually get through it and will be sure to read everyone’s thoughts on and after the 15th.